We've been keeping a close eye on Carlyle Group co-founder Daniel D'Aniello, whose net worth stands at $2.8 billion. Unlike his business partner David Rubenstein, D'Aniello has only recently begun to ratchet up his giving. Most notably, D'Aniello gave the American Enterprise Institute $20 million to help the conservative think tank move into its first permanent home in the organization’s 75-year history. D'Aniello's latest gift, also for $20 million, supports the construction of the National Veterans Resource Center to house Syracuse University's Institute for Veterans and Military Families (IVMF). Commenting on his approach to giving a few years ago, the Syracuse alumnus told the Washington Post's Roxanne Roberts, "What's in my mind is that I'm investing in people. It might be through a building or a program, but I'm investing in people. And the people that I’m investing in are underprivileged or hold a core value that I believe in." I'll loop back to D'Aniello in a moment. But first, I'd like to explore the other big story, here—the extent to which funders increasingly view colleges as a critical nexus point to help veterans reintegrate into society. I looked at this trend after the Walmart Foundation gave a $500,000 grant to Boston University to launch the Women Veterans Network. Funders are a pragmatic bunch, and universities provide a strong platform to support veterans, because key assets to help them succeed, including housing, financial supports, counseling, career services, and—of course—teachers and classrooms, are already in place. 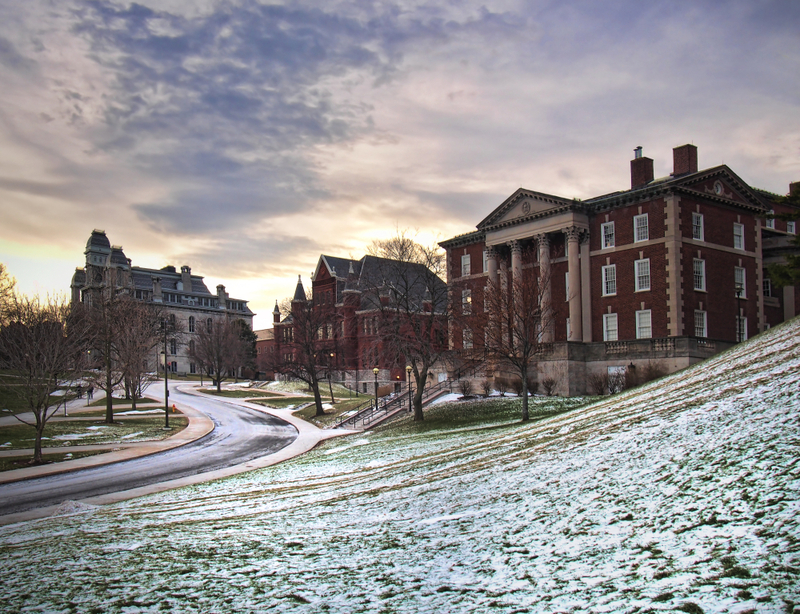 The IVMF's ability to leverage Syracuse University's assets has been integral to its success. Around the time of the institute's launch in 2011, founder Mike Haynie sat down with officials from JPMorgan Chase to discuss his vision. According to Justin Mattingly, writing in the Daily Orange, the meeting lasted about seven minutes. The university officials walked out  of the meeting room with a $7.5 million commitment. "I think the success in the conversation we had with JPMorgan Chase was not about doing research and the impact that could have, or the policy analyses and the impact  that could have," Haynie said, "but it really was about how we could effectively leverage what higher education does well—teach, train and inspire—to develop our programs such that we expand both the breadth and the reach of those programs to have real, tangible impacts on veterans and their families." Other funders soon got on board. Lockheed Martin provided a founding gift, thereby making it the institute's first One-Star Corporate Partner. In 2015, First Data Corporation announced a $7 million, seven-year commitment earmarked for education, research, training and job training. In February 2016, JPMorgan Chase announced a renewed $13.8 million commitment through 2020. And in the same year, Lockheed Martin pledged $1 million over three years to support the IVMF's veteran entrepreneurship and reintegration programs, citing the institute's ability to "quickly (and with impact) seed and cultivate connections in key markets and customer segments." The IVMF's fundraising success is even more startling once you realize that as a "soft money" organization, it does not receive funding from Syracuse University. Which brings me back to D’Aniello's $20 million gift. D’Aniello grew up in modest circumstances and was a supply officer in the United States Navy from 1968 to 1971. He subsequently earned a graduate degree from the Harvard Business School and embarked on an extraordinary rise to wealth. In 2016, he was awarded the U.S. Navy Memorial Foundation’s Lone Sailor Award for drawing upon his sea service experience to "achieve success in his personal and professional life while exemplifying the core values of honor, courage and commitment." While most of D'Aneillo's giving remains private, he follows what he calls his “five pillars” of philanthropy: faith-based giving (food banks, housing and assisting aging priests and nuns), educational programs, free enterprise, the performing arts (recipients include the Virginia-based Wolf Trap Foundation and Washington National Opera), and mental health research. As for his gift to Syracuse University, D’Aniello said he was honored to support his alma mater’s bold vision and ambitious goals. "Gayle and I are proud to be able to support current and future students, especially those who have and will serve in our nation’s armed forces." "This new center will allow Syracuse University to help our nation not only respond to but anticipate the unique needs of this population by helping veterans more seamlessly transition to civilian life. To say this center is a game changer in the ongoing efforts to better the post-service lives of our veterans and their families is an understatement." Looking ahead, we expect more big gifts from D'Aniello. Though he hasn't signed the Giving Pledge, D'Aniello told the Post's Roberts that the Pledge's minimum 50 percent commitment isn't enough. "If you're only going to give away 50 percent of your wealth...c'mon, I'm going to do much more than that."